It's been a few days since I've been able to blog. Things have been pretty crazy around our household since our new little arrival. My mom (Gram) came in from Ohio on Friday evening, just in the nick of time... This new mama needed her own mama's help! We've been really enjoying these past few days with our little man. Listening to his baby coos, laughing at his funny faces and snuggling him in all of his cute little baby-ness. Today is our first Valentine's Day as a family. Jason got me a gift card for a well needed (and deserved!) massage and some brand, spankin' new Reef sandals (my favorite!). I got Jason a gift card to PF Chang's so he can go and get some yummy food! Aidan also got his Gram a Valentine's Day gift- dark chocolate truffles and some delicious hot tea varieties. 1. His devotion to our family. He never hesitates to show and tell me how much he loves me and it's all ready so evident that he loves Aidan more than he ever thought he would. 2. His subtle sense of humor- this man is always making me laugh! 3. The way that we can both quote movies to each other all of the time... and a lot of times at the same time when we are in a certain situation. 4. His great ability to do home improvements- he is definitely a hand man! 5. His amazing work ethic- he always gets the job done, and does so with determination and hard work. 6. His cooking ability- he can only make a few dishes, but the ones he does make are AWESOME! 8. His love for all creatures great and small- including our little furry children. 9. His ability to be able to talk to anybody in any type of social situation. He is that guy who can relate to absolutely anyone and never feels out of place. 10. His patience- never does it run out. All in all, you can see that my man is the best! Yup, the best! 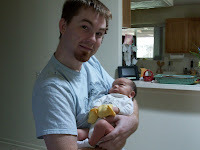 Look at you, blogging with a six day old! I'm super impressed! BTW, thanks for sending me the link to his pictures on FB. I haven't been on there to tell you how cute they are!